This bag has been on my mind for a while now. 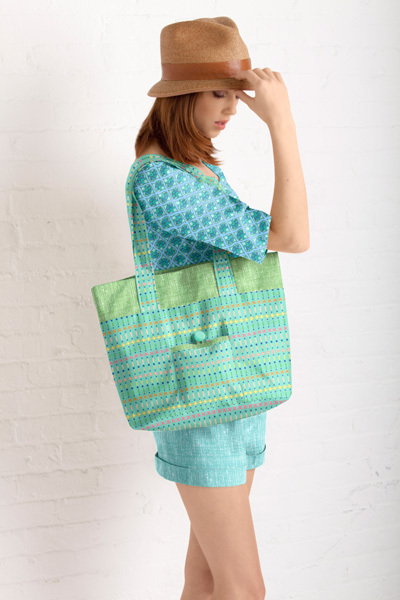 I’m glad I finally get to share the new Lisette Foreign Exchange Bag with you! The idea for this bag started long before I launched Oliver + S or Lisette. It was the second pattern I developed for a sewing class at Purl, back when I was teaching beginning sewing and wanted a good pattern we could use for the class. I wasn’t really inspired by the patterns that were available, so Joelle encouraged me to develop one of my own. The result was actually two patterns: the Day in the Park Convertible Backpack (a few copies of the pattern are still available at Purl; once they’re gone, that’s it!) and this one, which we never published. Over the years I’ve thought about it now and then, and I’ve come up with ideas to improve on the bag and to add to it. 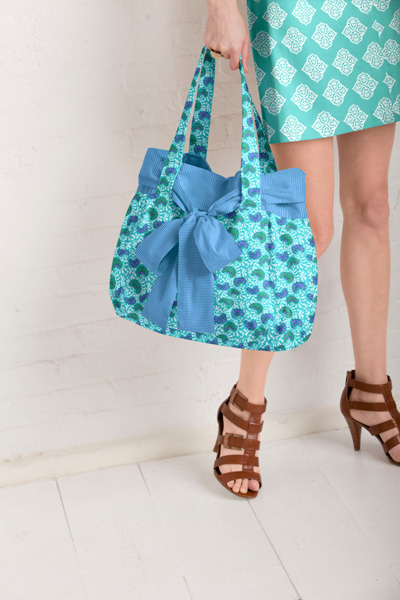 So when it came time to develop our first Lisette bag pattern, this was my chance to finish the pattern the way I had envisioned it. The pattern includes two different sizes and shapes. There’s the really big version, which is the one I’m carrying in this photo (because New Yorkers don’t have cars and need to carry everything they need for the entire day along with them, we like big bags) and the smaller size (for those of you who don’t carry as much, or who can leave some of your stuff in the car). Each size has two different styles. The first (the one I’m carrying, above) is the sweet, feminine style with a big tie that cinches up the top and makes a big bow. The straps become the “belt loops” for the tie, but since the tie is removable you could always take it off and use the bag by itself, without the tie, if you wanted. Then there’s the more tailored version, which features a pocket on the front. It has a clean look, but you can use a contrast fabric for the binding at the pocket edge, and of course you can have lots of fun with the button. So you can make this version as fancy or as minimalist as you like. Anyway, inside each bag we’ve included a nice zippered security pocket for your valuables as well as a divided patch pocket for your cell phone, etc. Both pockets are easy to sew and add a lot of nice details to the bag. And the lining itself can, of course, be a fun fabric. 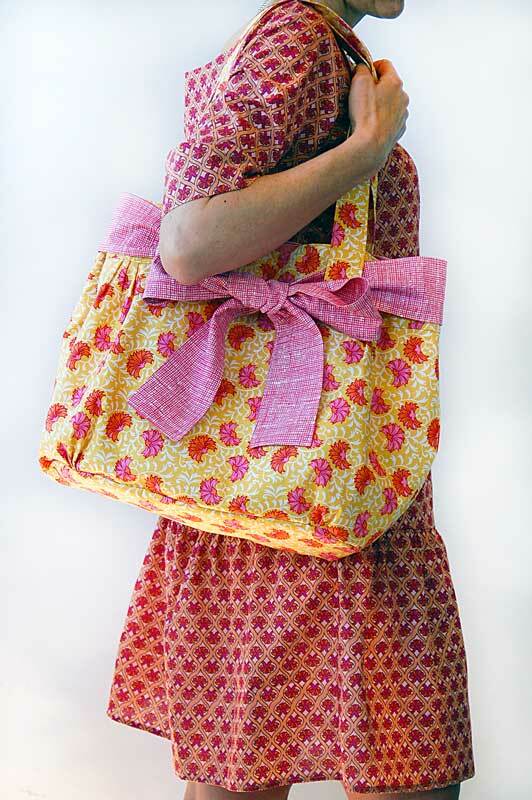 I used the Little Lisette firefly print inside mine and love it. Oh, I nearly forgot to mention the cosmetic case/pencil case! 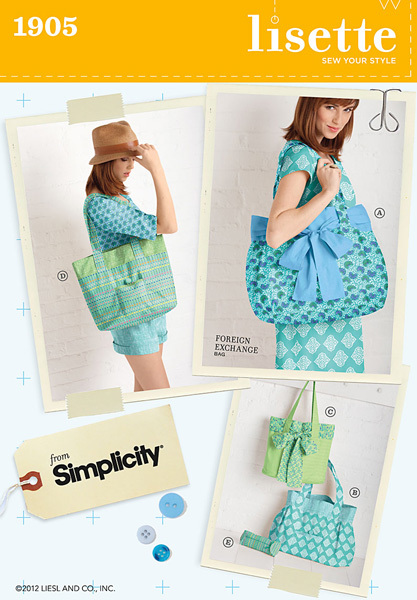 It’s really cute because it sort of mimics the shape of the bags, and it comes with the bag pattern. I especially like the tabs at the ends. They sort of hide the zipper and make it easy to open and close. 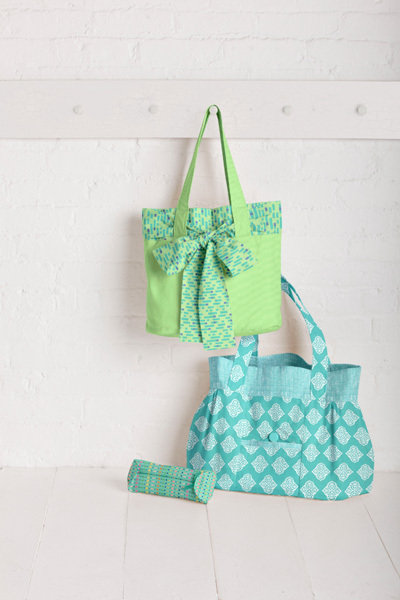 So which bag are you going to make, and which fabrics will you use? One can always use more totes & bags! Do you think that view C (the boxier, not gathered version) would work in one of the laminated cottons I’ve seen lately? Oh I loved this bag the minute I saw it and now I’ve read your introduction I’m excited to get started. It sounds like you’ve thought of everything with those inside pockets. I want the big one (I’m a city girl too, so I know what you mean, plus I have three little ones) with the bow. I’m thinking of a neutral color with maybe more than one bow I could change out to match outfits. Perfect for spring brak and summer outings!